Maretron products provide simple, reliable solutions for vessel monitoring, control and data recording. At Frontier Power Products we specialize in propulsion and auxiliary power systems. Vessel owners and operators need real-time, easy-to-use monitoring and control of these components. As well, it may be advantageous to store operational data to assess fuel economy or to determine events that led to a failure or alarm situation. Frontier Power uses Maretron components because they are simple, flexible and reliable. In addition to the power systems usages, Maretron complies with NMEA standards to easily permit the monitoring and control of other vessel systems such as tank levels, fuel flow, batteries, run indicators, rudder angle, temperatures and many more. Maretron products allow for easy expansion with standardized components that can be adapted to monitor and control almost any of your vessel’s complex systems from a single or multiple stations. We are a proud distributor of Maretron vessel monitoring and control systems in Western Canada. 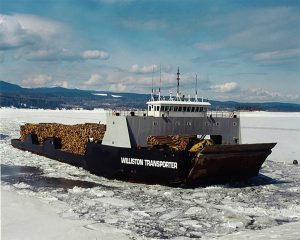 An icebreaker transporter built with Maretron alarm and vessel monitoring systems. Two commercial tugs built in BC with Maretron alarm and vessel monitoring systems. Two new tugs for Catherwood Towing with Maretron vessel monitoring systems. Two new vessels for the City of Vancouver using Maretron alarm and vessel monitoring. Two Bratt tugs built and delivered to Suncor Energy for use in the tailings ponds in Alberta. This was a Robert Allan designed vessel. All monitoring and alarm systems provided by Maretron.